I tried downloading Delphi Community Edition in the hope I might be able to use the IDE as a debugger in Windows - I'm getting freezes fairly regularly now - but it doesn't offer me the choice of the Delphi IDE when I click "Debug" in Task Manager - it still only shows me Visual Studio. Is there a trick to opening the pspad exe in the RAD IDE? x /D PSPad!s* shows a massive list of PSPad!System symbols, which does suggest the symbol table is loaded. The interesting thread seems to be stuck recursing inside COMCTL32!TV_GetShownIndexItem+0x52 - there's 27 levels of that in the call stack. All the other threads seem to only show either ntdll!NtWaitForWorkViaWorkerFactory or ntdll!RtlUserThreadStart. If you've any idea of how to get windbg to show anything more helpful then I'm happy to give that a try. If I disable the code explorer window then the problem seems to stop, which does suggest it's related to the recent changes in that area. There seems to be a problem in the php highlighter: the initial "<?" of the php opening tag is invisible, although it takes up space and will appear if selected. The closing tag ("?>"), if used, is also invisible but will also appear if selected. This is true for both new and old files. The rest of the hightlighter works as expected. After update to build 283 the INI file is changed. 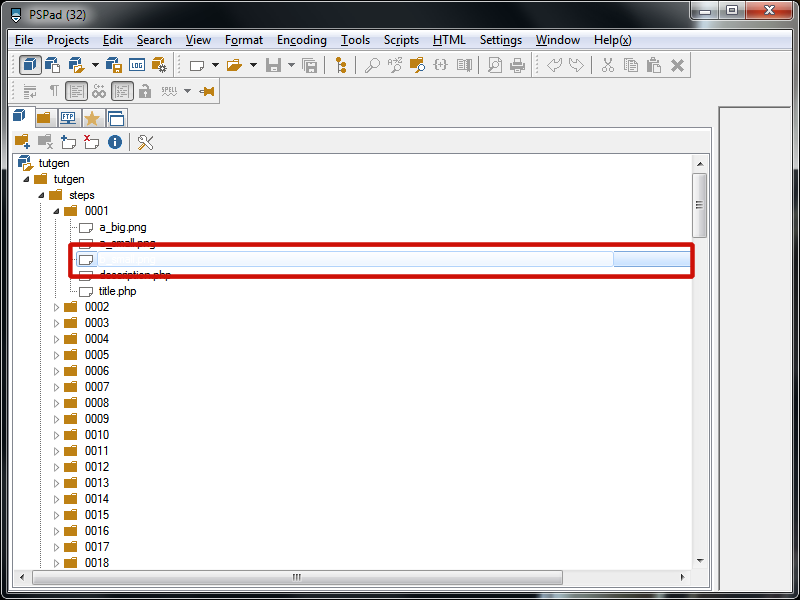 Firstly in the Search in Files Results window a single left-click on the little triangular icon before the file name used to expand or collapse the list of lines found in the file - now this only happens with a double_click. Secondly the current line is being shown with a beige background unless I go to Settings/Program Settings.../Colors and set the colour for Current Line to white - but then the next time I start PSPad it has reverted to the beige backgound. This may well be connected with the earlier report about PSPad no longer respecting the selected colour theme. Thank you for issues report. I will fix it. I found this problem this weekend, it's fixed already. Please ignore if this issue is covered by your immediately preceding post. Edited 1 time(s). Last edit at 2018-10-02 07:18 by programmer9. using the 32-bit version in Win7 64-bit, names of selected folder and file names in the tool-panel are being replaced by a framed box.